In this brilliant debut thriller, reminiscent of the works of John le Carre and Olen Steinhauer and infused with the authenticity of the author’s travels, a young American State Department intern based in Turkey becomes “the woman who knows too much” and is marked for death. Penny Kessler, an intern at the US Embassy in Ankara, Turkey, wakes up in a hospital on the morning of July 5th to find herself at the center of an international crisis. The day before, the Embassy was the target of a devastating terrorist attack that killed hundreds of Penny’s friends and colleagues. Not only has a photograph of Penny as she emerged from the rubble become the event’s defining image, but for reasons she doesn’t understand, her bosses believe she’s a crucial witness. Suddenly, everyone is intensely interested in what Penny knows. But what does she know? And whom can she trust? As she struggles to piece together her memories, she discovers that Zach Robson, the young diplomat she’d been falling for all summer, went missing during the attack. And one of the CIA’s most powerful officials, Christina Ekdahl, wants people to believe Zach was a traitor. August Thomas began her first novel, Liar’s Candle, at age twenty three. Fluent in Turkish, she has traveled and studied in Turkey as the recipient of a Fulbright Scholarship, and holds Master’s degrees from Bogaziçi, Istanbul’s top public university, as well as the University of Edinburgh. She also has two degrees from the University of Massachusetts. A travel writer as well as a novelist, she lives in Massachusetts. You can find her at AugustThomasBooks.com. “August Thomas is a fresh, exciting new voice in international thrillers." 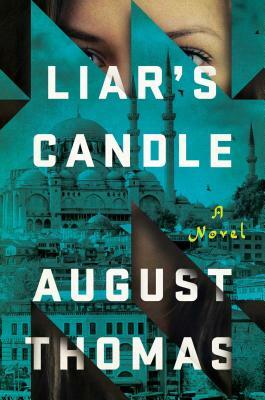 "Tightly-plotted, well-written, and astute, Liar’s Candle is a remarkable debut. August Thomas delivers an atmospheric and twisty spy thriller that manages to be both assured and fresh. With a colorful, authentic sense of place, a rocket-paced plot full of deception and betrayal, and a young, naive heroine, Penny Kessler, at its center, this is both an exciting story of espionage and a compelling coming of age tale." "August Thomas offers a fresh voice and a unique perspective. Liar’s Candle is a tight and well-crafted novel with a compelling heroine and a breakneck-paced story that will keep you turning the pages until the early morning hours. What an extraordinary debut!" "Readers who love [Thomas'] breathless pace will be eager for her next effort in the espionage fiction sweepstakes."